With two weeks to the June 24 primary, the final campaign blitz is underway, and one of the most common tools, yard and road signs, are cropping up like dandelions — despite limitations by the state and its jurisdictions on where the signs may appear. Signs may not be erected on any interstate or numbered highway and state right-of-ways. But places like Baltimore County’s York Road (Route 45) and Wisconsin Avenue (Route 355) in Montgomery County — any busy and popular roadway — are where they tend to materialize most, according to State Highway Administration spokesman David Buck. Daily, SHA maintenance crews statewide uproot political signs, Buck said, from roads, on utility posts, sometimes the poles of traffic signals. Part of a crews’ everyday responsibilities include elimination of all signage in breach of regulations, encompassing advertisements, political signs, and anything not traffic-related — because it distracts drivers from the road. As election day approaches, SHA might allot a day solely for sign removal, though Buck said those type of materials tend to emerge on roads closer to a general election rather than a primary. An ousted sign may be claimed at the SHA maintenance shop close to where it was pulled — some counties maintain multiple maintenance shop locations. Staff will typically keep the signs for a couple of weeks before trashing them, though smaller signs, or dirtied ones, will be tossed immediately. Few campaigns will collect the signs, but if they do, Buck said SHA staff will remind them of the regulations. SHA does not attempt to contact candidates. During the election season, officials might put out a social media blast refreshing the public of the signage law, or a press release, though one on the subject hasn’t been released in a couple of years. SHA oversees roughly a third of the state roads, the ones in their purview carrying three-fourths of the state’s traffic. Each of Maryland’s 24 jurisdictions impose rules for county-owned roads and private property. Baltimore County forbids placement on a county right-of-way, and requires permission from a property owner to stick a sign on any private lot. Among some of the regulations, residences must not contain a sign larger than 8 sq. feet (2 feet by 4 feet), and signs on commercial lots may not stand larger than 50 sq. feet. Campaign signs at Gwynns Falls Parkway and Tioga Parkway in Baltimore City. A federal judge ruled a portion of the Baltimore County code pertaining to political signs unconstitutional in 2007. 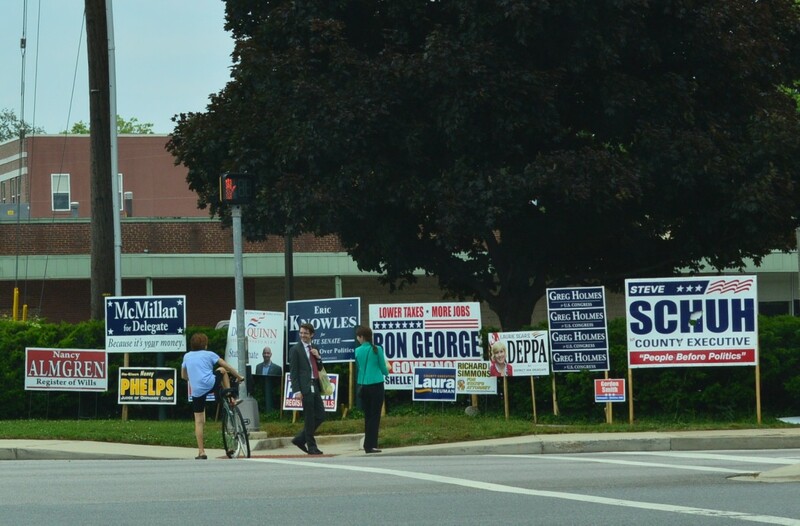 Prior to that case, brought against the county by American Civil Liberties Union of Maryland, campaign signs couldn’t be erected until 45 days before the primary election, and had to be removed seven days following an election. Anne Arundel County code, however, still dictates a political sign be removed a week after an election, and that a sign can’t be posted more than 60 days before an election date. Officials do not allow placement on county right-of-ways, or a sign larger than 9 sq. feet on a residential lot, 24 sq. feet in all other districts. In Montgomery County, officials require residents to seek a permit if a political sign will remain on a property, residential or commerical, for more than 30 days. On a residential property, a sign can’t exceed 9 sq. feet, and on a commercial lot, it can’t be larger than 50 sq. feet. With the permit, Montgomery County allows a sign on county right-of-ways, though not on a highway median — and it must also not be higher than 2.5 feet, at least 2 feet from a curb or 6 feet from the edge of a roadway. Enforcement of a sign prohibition can be difficult, Buck said — signs taken by an SHA maintenance crew might re-appear within an hour, but he said he’s never encountered a candidate repeatedly, maliciously violating the regulations. Local law enforcement agencies handle any cases of sign theft or vandalism. The State Board of Elections addresses no campaign signage laws, except the rule that signs may not be within 100 feet of an entrance or exit of a polling location, according to Deputy Administrator Nikki Charlson. Contact your local zoning agency for more information on specific sign regulations.